What Affect the Range 2 Fire Would Have on a Creek Like Lamoille Creek. I was asked earlier this week what affect the Range 2 Fire would have on a creek like Lamoille Creek in the Ruby Mountains. There are a number of things that may happen as a result of a catastrophic fire like this one. Probably one of the first things that will happen is that after a rain event, like the ones we had on Tuesday, Wednesday and Thursday evenings, ash will wash into the creek. This will take the water to the basic side of the pH scale killing fish and invertebrates, which are the aquatic insects that trout eat. The heat from the fire also causes rocks and soil to expand, cracking and loosening them up. This already has dislodged rocks on the hillside causing them to roll down the mountainsides. If you talk to firefighters that were there this week, they had to clear the road of rocks to pass by, only to have to clear it again at the same place on the way back down. Besides landing on the road, rocks will also end up in the creek. With winter around the corner, the melting and freezing of water from snow will seep into newly formed cracks expanding as ice does and causing more rocks and soil to head downhill. In the spring as the snow melts, expect mudslides and slumping hillsides to move a fair amount of soil and rocks into the bottom of the canyon, again, causing material to enter the creek. If enough material enters the creek, it may even change the streambed in some places. This can also muck up gravel beds that provide spawning habitat for trout. Besides ash, rock and soil, deadfalls from burned trees and shrubs will also probably end up in the creek. Some may stay in the canyon, but a fair amount may be washed downstream, hitting fences, bridges and irrigation diversions. So how about some good news. After watching aerial video shot from a helicopter moving down the canyon, a fair portion of the riparian zone along the creek managed to survive the fire. This is the wettest part of the canyon and so was resistant to severe burning. This will help to keep the water cooler during the hot summer months next year and provide fish some cover from avian predators. As of the writing of this article, with firefighting efforts and Mother Nature’s timely dropping of precipitation, the upper third of the canyon appears to have survived without any major burning. That means that fish and invertebrates from upstream will start to repopulate the downstream portions of the creek as the water clears and returns to more normal pH levels. While debris entering the water system will cause some problems, it will also provide cover and habitat for fish. Future heavy snowmelt that occurs in Lamoille Canyon will start to help clean out the gravel beds after vegetation growing on the hillsides stabilizes the soil. 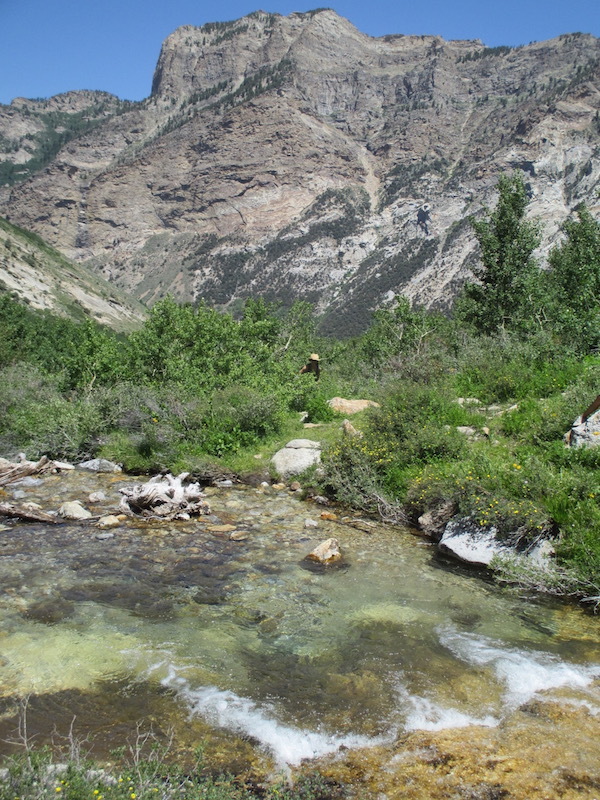 Lamoille Canyon is in a fairly high precipitation zone that should help native plants to come back and have a good chance at outcompeting invasive species that often grow at lower, drier elevations. Jakes Creek Reservoir (Boies Reservoir): Bass From a Float Tube or Small Boat is Good.